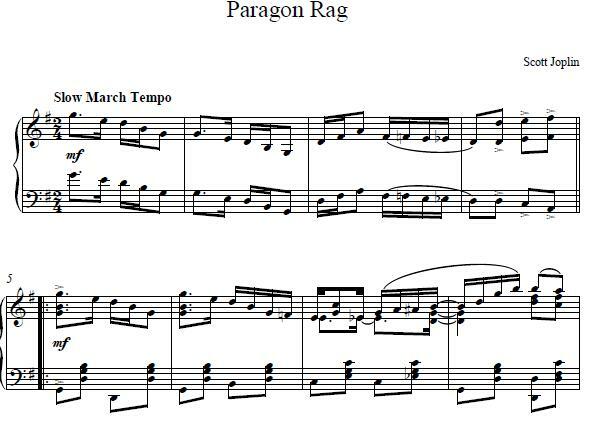 Paragon Rag is a piece that came out of Scott Joplin’s later—and extremely creative—time in New York; it was among six rags published in 1909 through Seminary Music, a publishing house that shared space with Ted Snyder Music (publisher of the fledgling Irving Berlin). He dedicated Paragon Rag to an organization called the Colored Vaudeville Benevolent Association, of which he was a new member and a group with whom he would stay active. Interestingly enough, its lofty name notwithstanding, Paragon Rag’s tune was based on a less “classy” but well-known song of the time, The Bucket’s Got a Hole in It—Can’t Get No Beer! It’s thought that Joplin learned this particular ditty during his days as a traveling piano player, picking up gigs along the way—and he wasn’t the only one to reuse the tune in composition, either. After this flurry of numerous publications in 1909, however, Joplin’s published output slowed. Part of this was due to a new style of rag, the “Tin Pan Alley Rag”—an easier style of rag to play than Joplin’s “classic” rag, and one which became more popular as a result. The other reason for a decreased rag output involved Joplin’s determination to compose and produce a ragtime opera, and he devoted much of his compositional time to that piece, Treemonisha. This lively rag has its own particular demands and difficulty level: in order to play the “B” section of Paragon Rag correctly, you need a piano with a middle sostenuto pedal—this will enable you to keep the final chord of each phrase sounding while you play the secondary melody above it. This type of three-pedal system was more common on a grand piano than on an ordinary household upright; the additional technical demands of playing the piece are, likewise, challenging enough for a player of significant talent. Play Paragon Rag at a brisk, crisp pace, and you’re likely to set more than your own toes tapping!